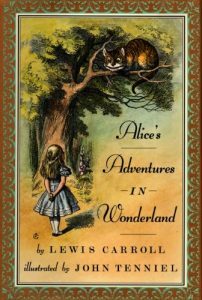 Lewis Carroll’s Alice in Wonderland tells the tale of a young girl as she falls asleep in a meadow one summer day only to find herself trapped in a world of fantastic animals and people, and engaged in a series of adventures. Alice is led by a White Rabbit down the rabbit hole where she meets talking animals, a ruthless queen, and a mysterious disappearing cat. The story was invented as Charles Dodgson (Lewis Carroll’s real name) was on a boating trip with three young girls. He invented the story to entertain them. As it turned out, one of the girls, whose name was Alice, asked him to write the tale down. He complied and within a year one of the most famous children’s stories had been created. Alice in Wonderland is now known around the world. It has been translated into numerous languages, been made into dozens of films, and has made its way into musical theater and ballet. The characters form the novel are instantly recognizable around the globe. Though the story is intended for children, there are some dark themes which attend the novel. Loss of innocence, the frightening confusion of the life, and even death are apparent in the story. Alice is confronted with dangers which are at times life-threatening. The nonsense world in which she is immersed is so bizarre that she cannot find her way out. While children will love the magic of the story, the novel is also quite serious. Even as Alice in Wonderland ends on a happy note, there is a strange sense of foreboding as the novel comes to its resolution. Alice wakes to find herself safe. She recounts her terrifying ordeal to her older sister who them attempts to transform the entire adventure into a simple and nostalgic lesson for older years. But the lines which contain this resolution are unconvincing. Alice seems to have found herself in yet another world of mystery and nonsense, and this world is the simple reality of life.